The Back 40 Farm Group will open Back 40 Kitchen this July on Greenwich Avenue, amodern take on organic farmhouse cuisine. Back 40 Kitchen will be a haven for those seeking healthy, organic food without sacrificing sophistication. The restaurant will source the majority of its produce from Back 40 Farm, an 85-acre family-owned organically managed farm in Washington, CT, as well as other regional organic and sustainable farms and purveyors. The Back 40 Kitchen dining experience has been crafted for a range of appetites and diets while remaining true to a 100% organic and health-focused menu. An early peek at the menu highlights snacks, small plates, flatbreads, and entrees, suh as: Green Eggs with Crispy Ham, and a Lobster and Avocado Toast, a house-made veggie burger to a honey-brined pork loin, and a classic Back 40 Burger, paired with bacon, cheddar and popcorn on a brioche bun. 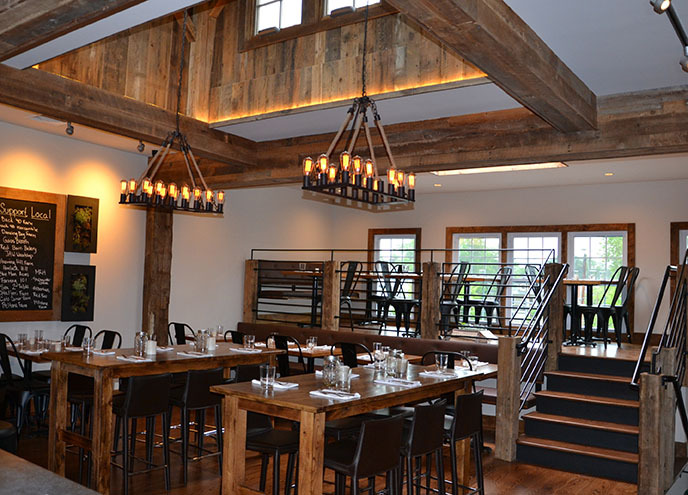 Back 40 Kitchen is owned by Greenwich residents Lesley and Bill King, who also own Back 40 Farm in Washington and Back 40 Mercantile in Old Greenwich, and the soon-to-open Mill Street Restaurant in Byram. They have tapped husband and wife team Jennifer and George Demarsico to manage the back and front of house. Jen Demarsico, Back 40 General Manager and organics enthusiast, leads the front of house team that will run the refined yet casual atmosphere of the dining room, an approach she cultivated during her work with Peter Kelly at Freelance Café, Tarry Lodge, and the Inn at Pound Ridge. The story of Back 40 Kitchen really begins on the Back 40 Farm, a family-owned 85-acre organic farm in Washington, CT of which the restaurant will rely heavily for its produce. The farm is managed by two famers, Nichole Norby and Alexis Barbalinardo, who both have strong ties to Stone Barns Center for Food and Agriculture. "Norby" is an electrical engineer turned organic vegetable farmer and a graduate from the Stone Barns Center for Agriculture’s Farmer’s Apprentice program. Alexis is a naturalist, educator, and farmer with a passion for good food. She has also worked as a cow-herder, cheese maker and most recently a greenhouse grower and propagator at the Stone Barns Center for Food and Agriculture. We look forward to getting up close and personal with Back 40 Kitchen as soon as they open in July, to fully experience their lunch, dinner and takeout options. Stay tuned for more about this farm-driven organicically-minded new restaurant! Back 40 Kitchen is located at 107 Greenwich Avenue in Greenwich, CT. [Main entrance in the rear, next to CVS.] Regular hours are Tuesday through Saturday for Lunch and Dinner, Monday is Lunch only.